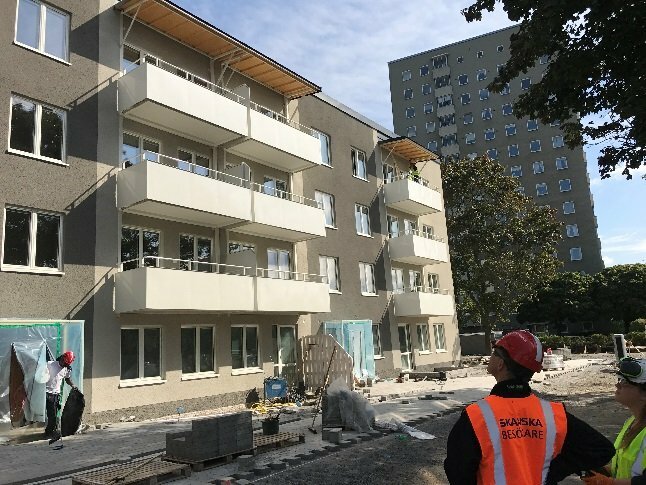 With construction nearly completed in Stegerwaldsiedlung, we held an informational event with tenants in the newly renovated buildings and area. 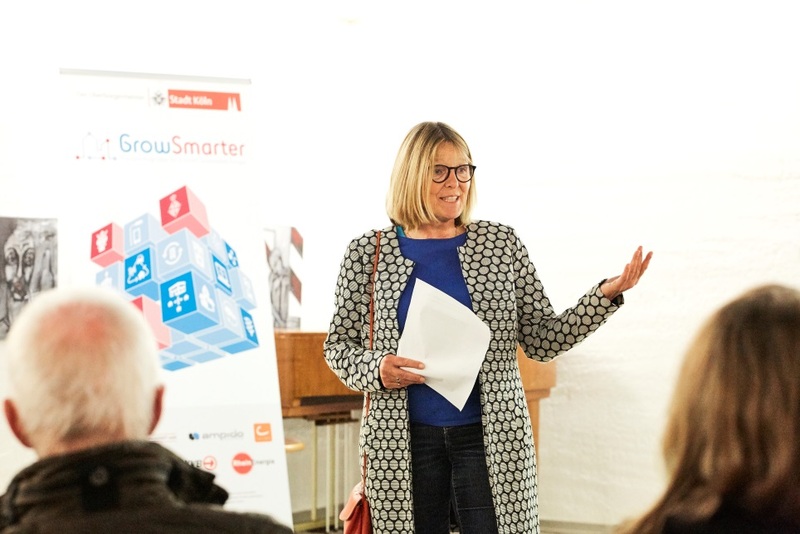 We've also been actively participating in a number of international events, sharing the experiences of the GrowSmarter project in Cologne with interested parties from all around Europe and the world. 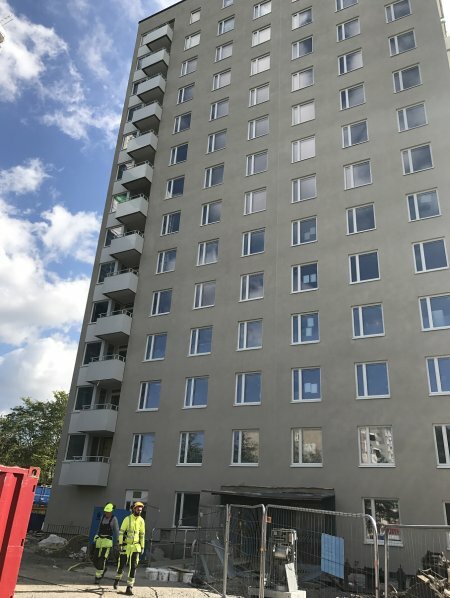 As the construction work in the project site area Stegerwaldsiedlung is almost complete, the project management and partners believed that it was time to hold an informational event for the neighbourhood tenants to inform about the process and foster acceptance. 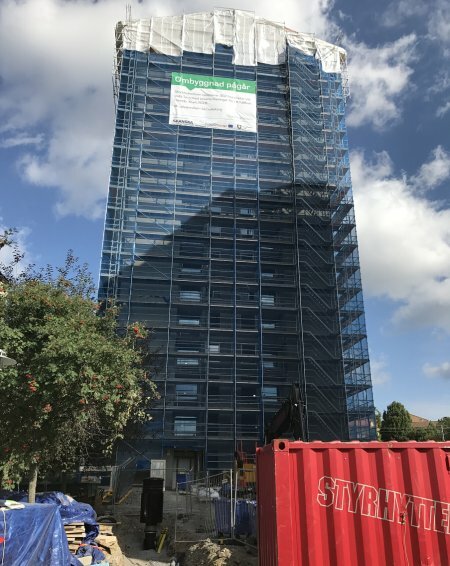 As the tenants stayed in their apartments during construction time, burdens such as long road closures, lack of parking spaces, construction noise, etc. had to be endured. 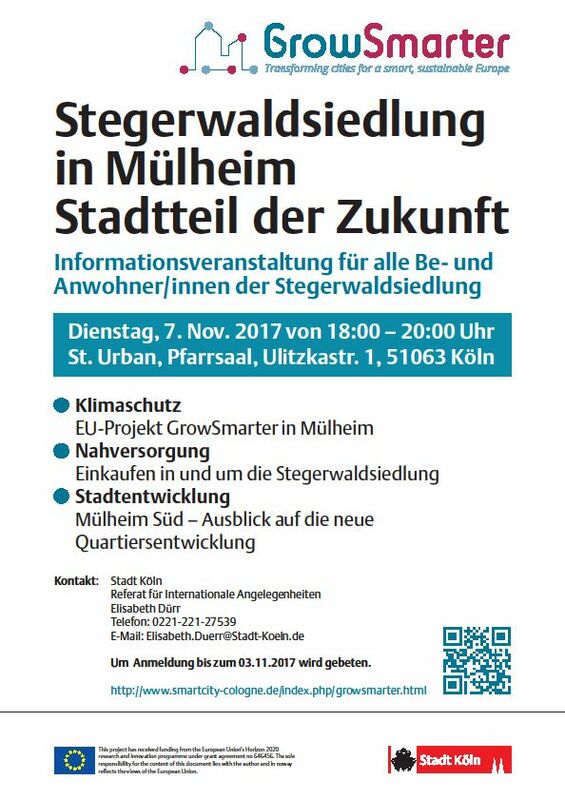 The City of Cologne together with the project partners invited the Stegerwaldsiedlung tenants to an informational event on November 7th, 2017. The invitations were distributed to all households in the project area and were available in all social insti-tutions. 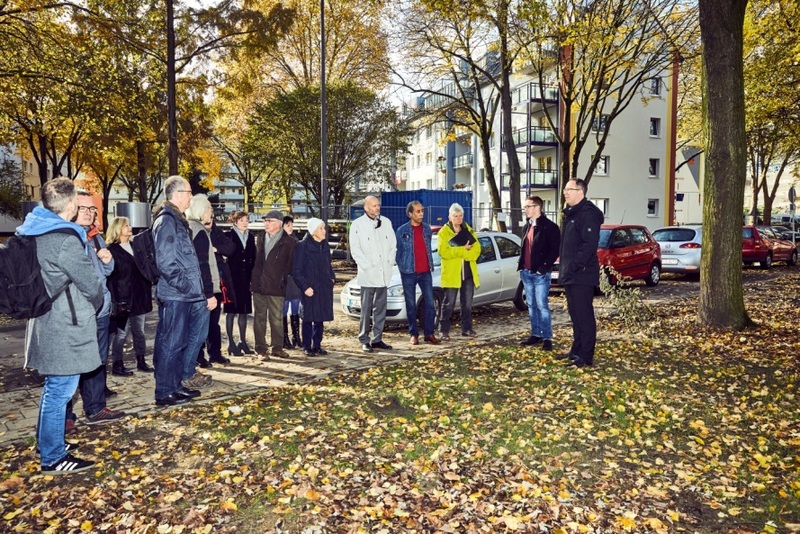 The aim of the informational event was to inform the tenants about the measures and the current state of the implementation, and to report on the perspectives that arise for the entire district of Mülheim. The event was supported by an external moderator and facilitated by the Community Reporter group (a group was founded to teach professional video shooting and then accompany projects they choose in Co-logne). 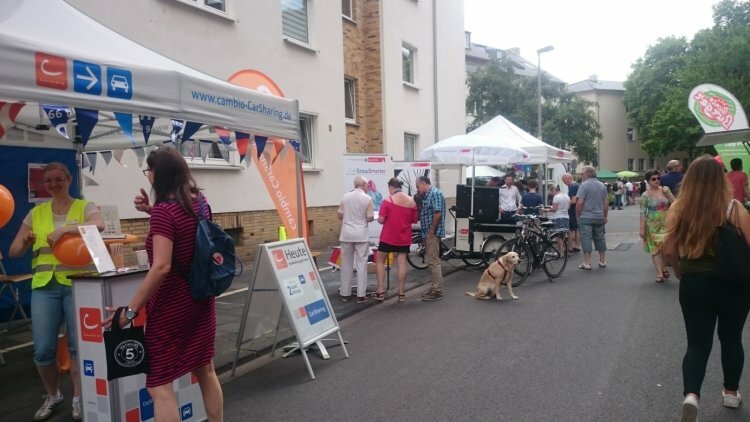 More than 100 tenants attended the event. The project management welcomed the attendees, explained the project goals, pre-sented the status of the implementation and pointed out the perspective until the end of the project and beyond. 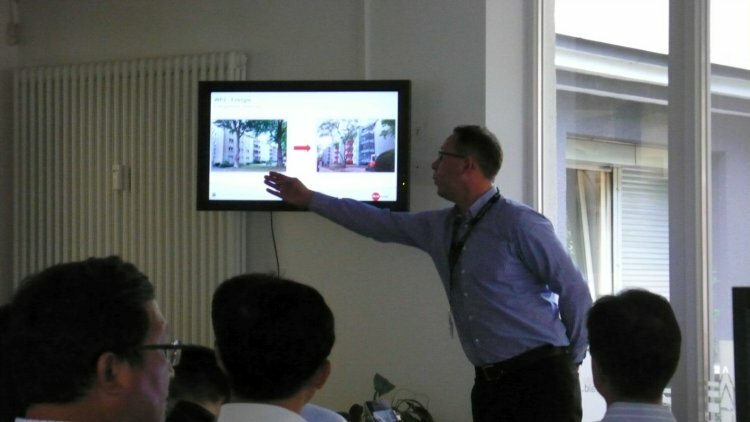 Most importantly, the team explained the benefits of the project for the tenants. 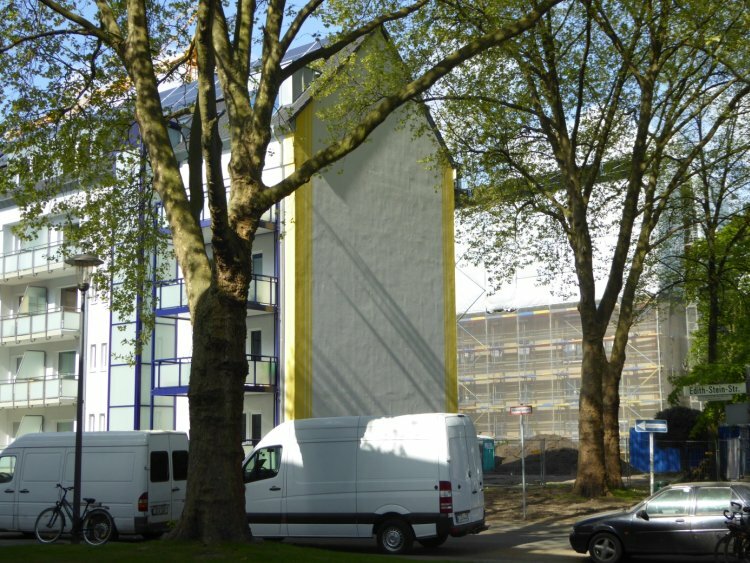 Two City of Cologne employees (City Strategic Planning and Urban Development) reported on how the district of Mülheim will develop in the areas of local supply, mobility and construction. The tenants were invited to ask questions and express their wishes. Many questions asked were related to the status of the construction site, new heating system, the parking situation and how high future rents will be. The next tenant informational event is planned for May 2018. 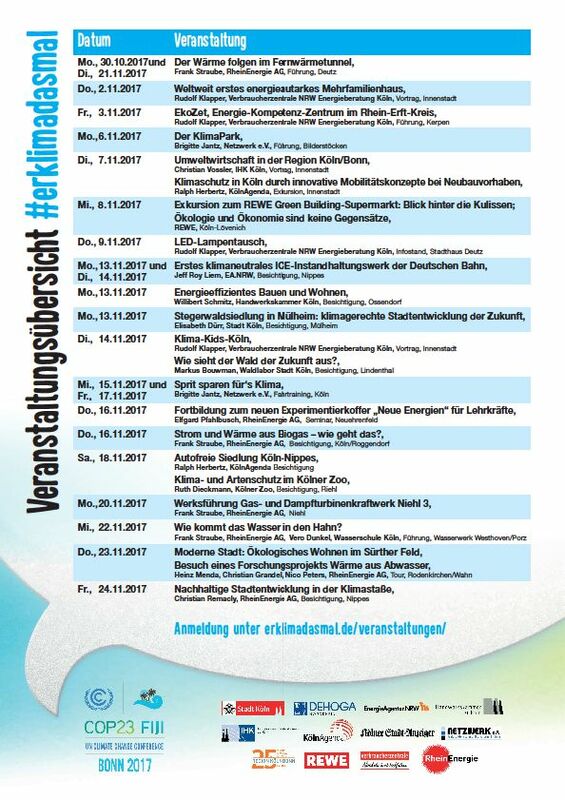 The World Climate Change Conference took place in Bonn from November 6 to 17. For more information please visit the official website. COP23 provided an extensive framework program surrounding the main programme for the conference participants. The aim of this programme was to show the participants as many projects as possible in the field of local climate protection activities. 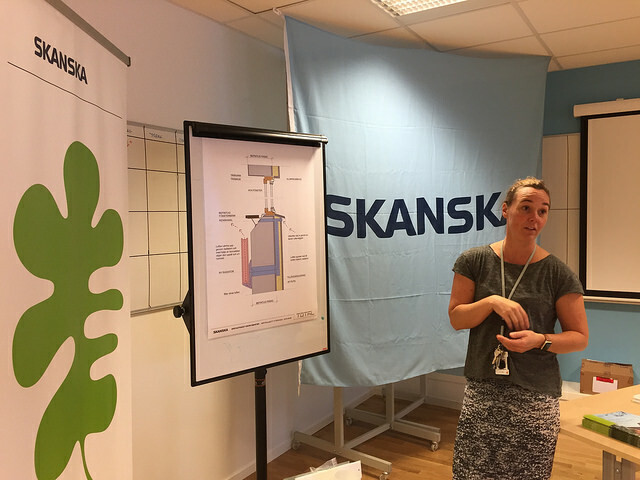 Within this context, the GrowSmarter project partners offered a study visit to the Stegerwaldsiedlung. 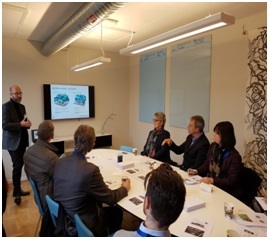 The The study visit, which took place on 13 November, was announced in a press release as well as in the COP23 event programme, which all attendees received. 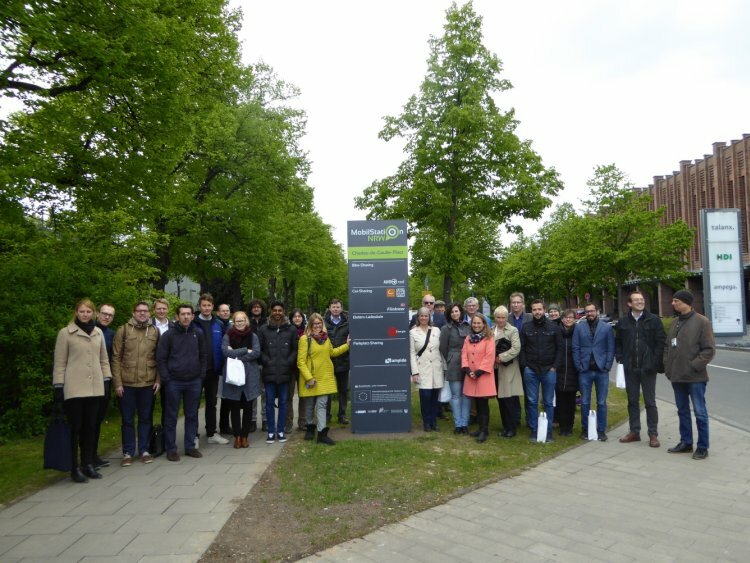 The GrowSmarter team conducted the study visit at the Stegerwaldsiedlung in both German and English. 26 people participated in the study visit. The project management team explained the overarching GrowSmarter goals and the efforts in all three lighthouse cities. 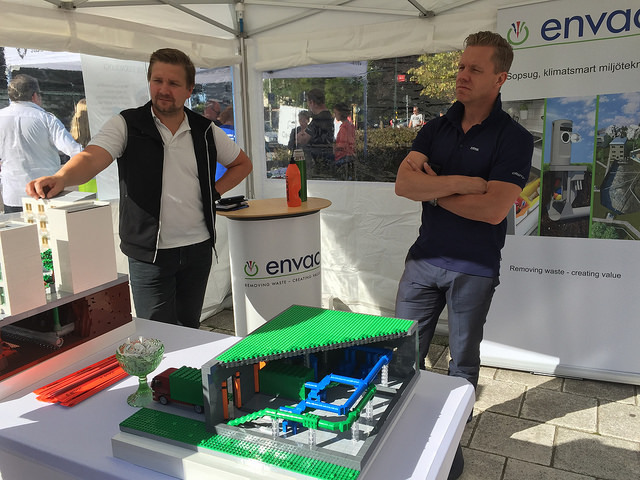 The local work-package leaders presented Cologne’s measures in energy, mobility and integrated infrastructure. 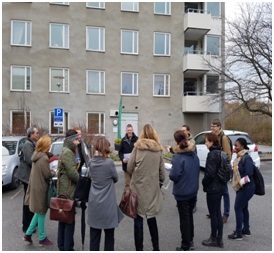 During the neighbourhood tour, the participants were able to see the implementation of the measures first hand. 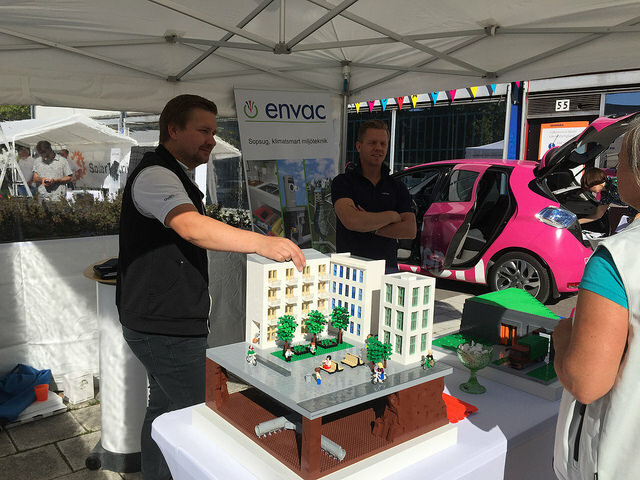 The solutions related to energy retrofitting, energy management with the control of neighbourhood management and the mobility stations were of particular interest. 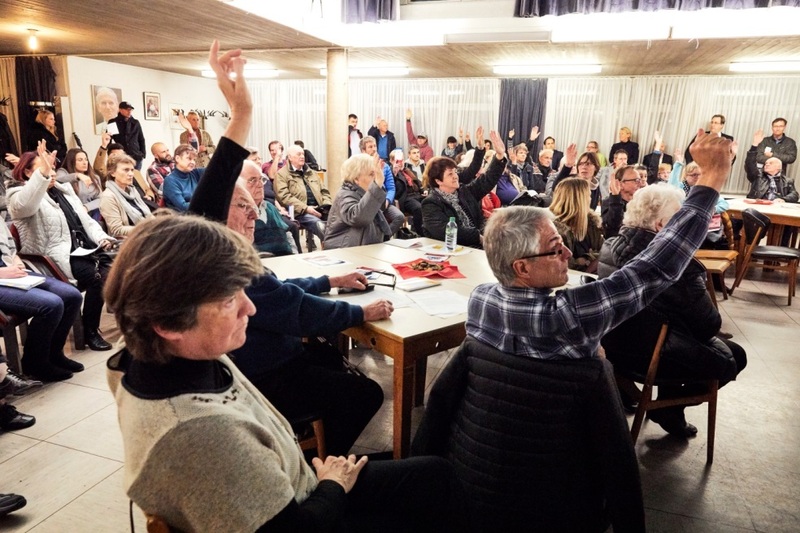 Many questions came up, including which measures were particularly effective, the prospects for transferring the measures to other cities and how residents are in-volved. 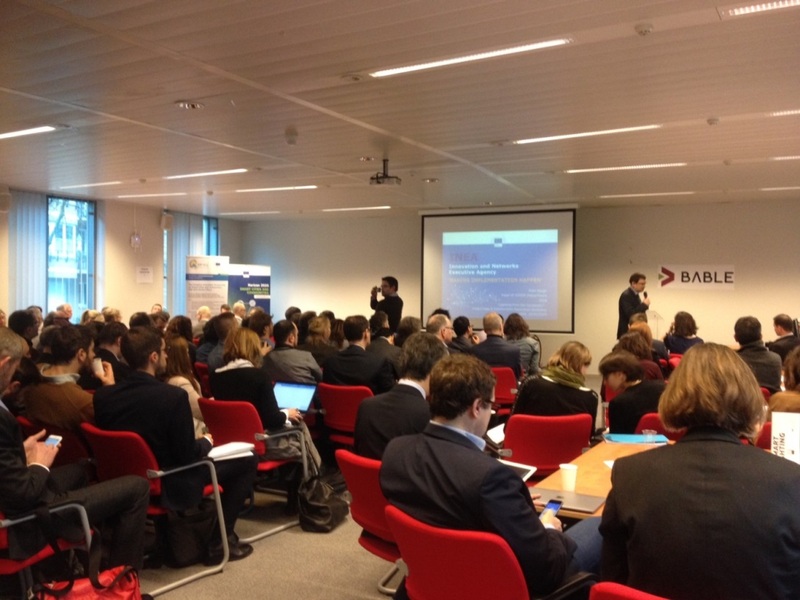 Participants were keen to continue the dialogue and to be kept informed about the project. 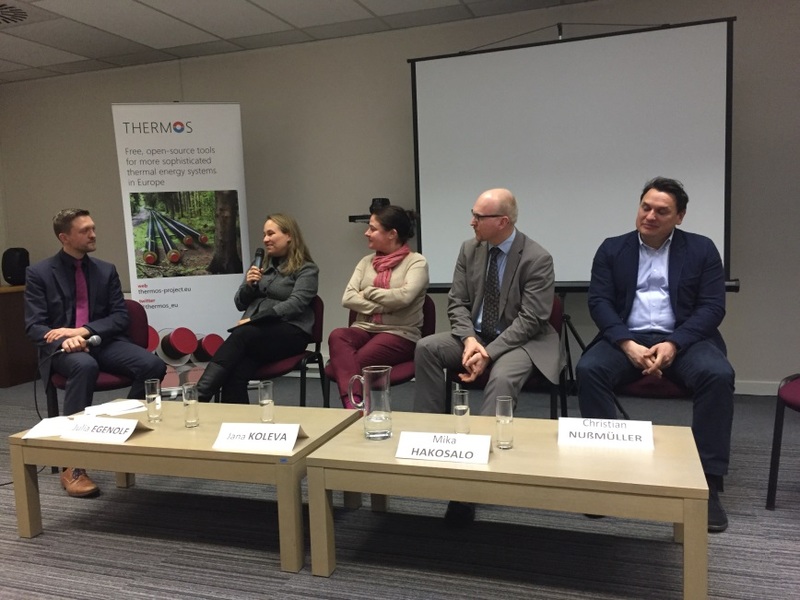 This event took place at the Permanent Representation of Romania in Brussels on January 25th, 2018. It addressed the question of making integrated heating and cooling systems part of the backbone of Smart Cities and Communities, including concepts on local, open and affordable energy transition by providing state-of-the-art planning tools, solutions and insights. 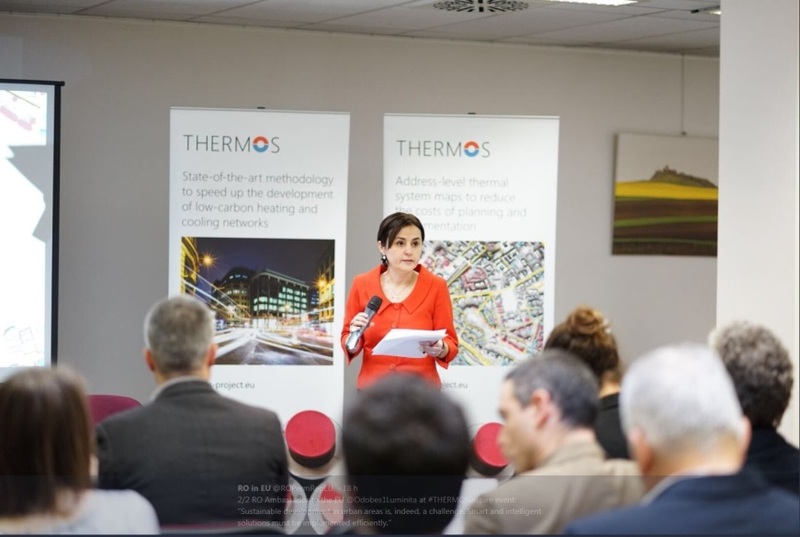 Cologne was invited to speak on a panel, providing the city’s perspective on thermal optimisation and refurbishment in the framework of CELSIUS and GrowSmarter. 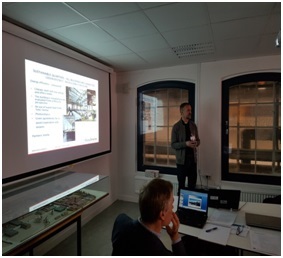 The SCC replication workshop titled ”Learning from the successful” took place in Brussels on January 26th, 2018 and focused on the question of how Lighthouse city Smart Solutions can be replicated in Follower Cities. How can stumbling blocks be overcome in order to achieve replication possibilities of Horizon 2020 projects and their solutions for Follower Cities? 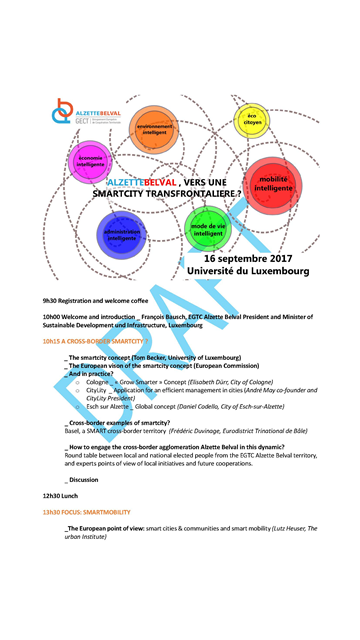 Three workshops, each held twice, were divided into 4-5 roundtables for the topics of energy, integrated infrastructure and mobility. The event saw more than 100 participants in the moderated workshops. 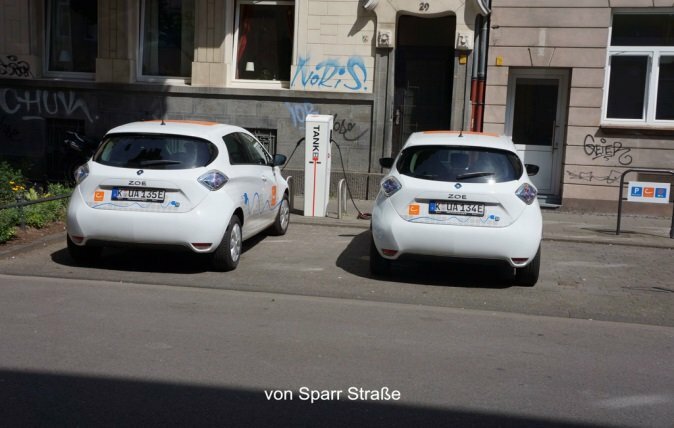 Cologne moderated the mobility roundtable, and car-sharer provider Cambio gave information on setting up mobility stations, as has been done in Cologne. 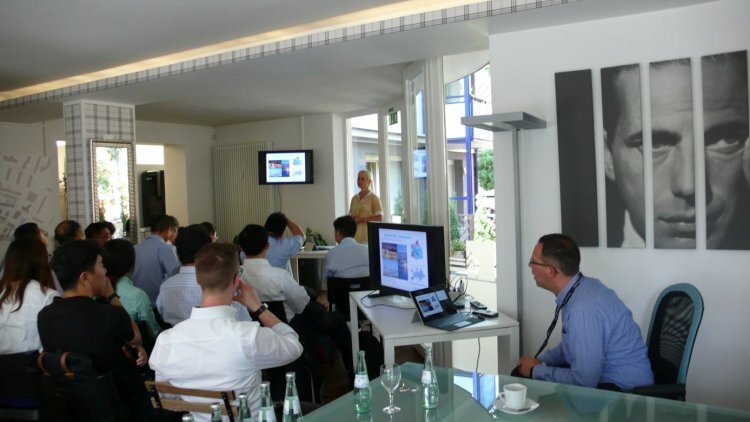 Cologne’s energy provider, RheinEnergie, participated in the roundtable on virtual power plants/energy management systems, including storage. 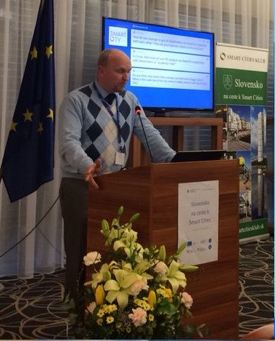 Each roundtable discussion was facilitated by a moderator who introduced presenters from industrial and city partners. The sessions started with a presentation touching on the planning, implementation, technical evaluation, business model and the replication possibilities of specific solutions. The participants then had 40 minutes to discuss barriers and possibilities to replicate. At the end of the workshops, the moderators summarised the key success factors and how to overcome the main obstacles. 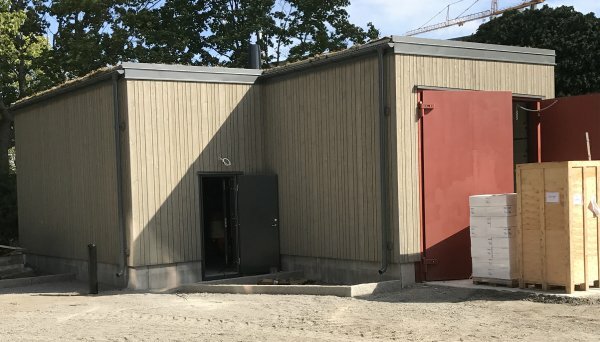 The first construction phase has been completed and the evaluation began in January 2018, as planned. The remaining construction phases are scheduled to be completed by March 2018, after which their evaluation phase will also begin. 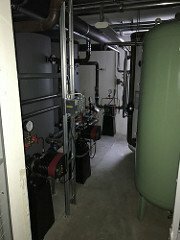 Both RheinEnergie AG and AGT international will send informational letters to all Stegerwaldsiedlung tenants until March and inform them about the possibility to have the Smart Home system installed for free. This will be done in up to 50 homes. 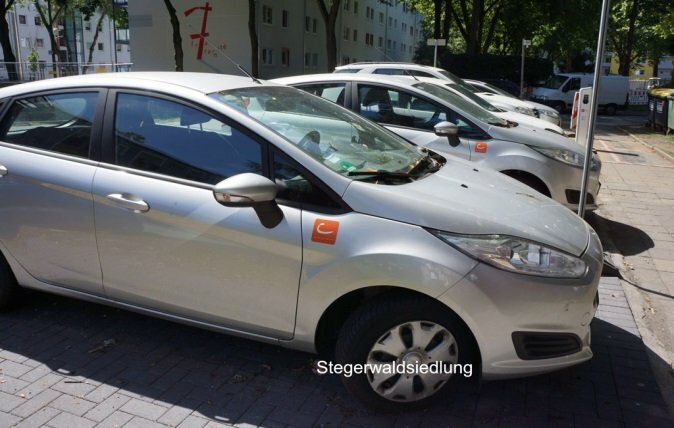 If there are more interested tenants than expected, RheinEnergie will have to assign them by lot. 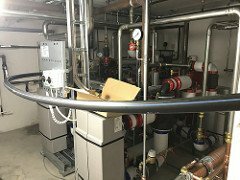 RheinEnergie AG was able to find a manufacturer who was prepared to equip its smart home system with an interface that enables AGT to collect and measure the required data (WP3). 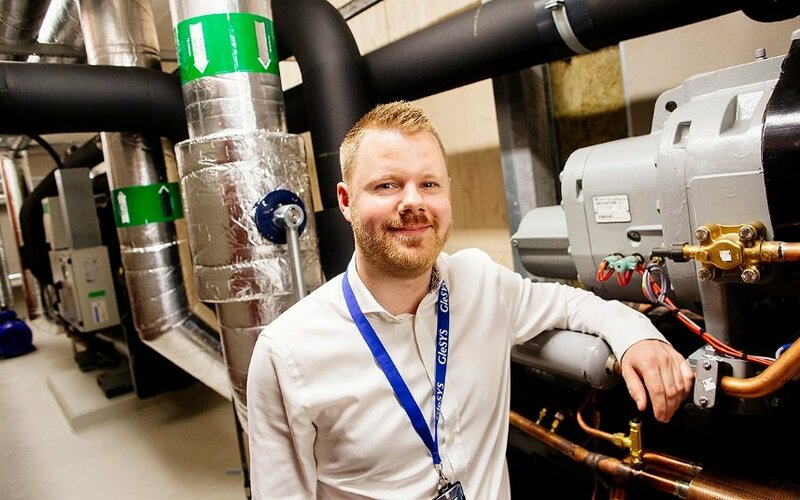 The system will be presented and demonstrated to the tenants in a workshop, where they can learn how to operate it in person and understand the advantages of the system. We intend to cover the first experiences with the system our the next blog update. 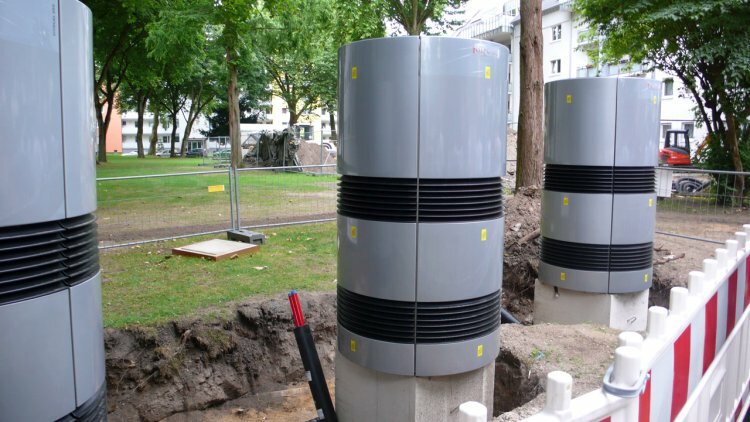 RheinEnergie was able to install three electric charging stations on existing street lighting poles. 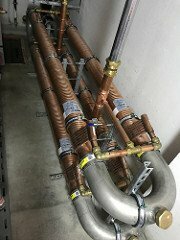 An existing WiFi grid connection hotspot is already in place at these locations. 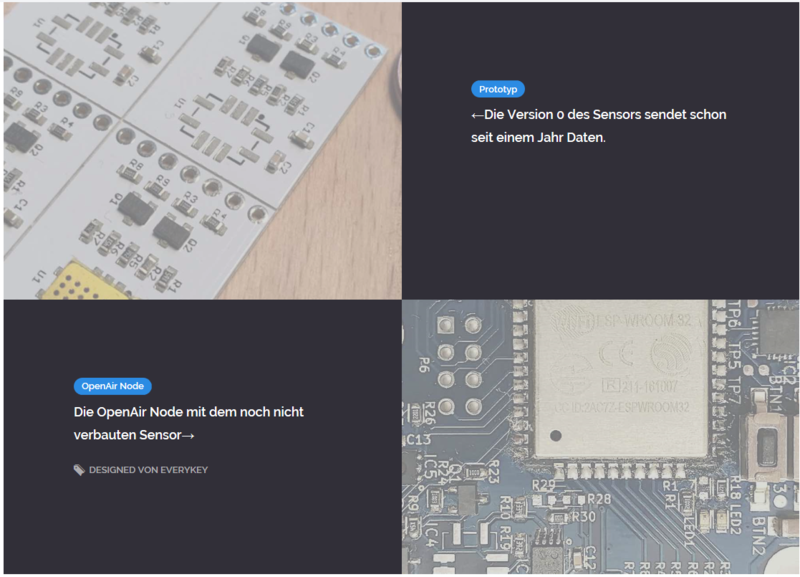 The community driven project ”OpenAir Cologne” has made progress; in the past months, the website has been editorially revised and the project was presented at several different events. 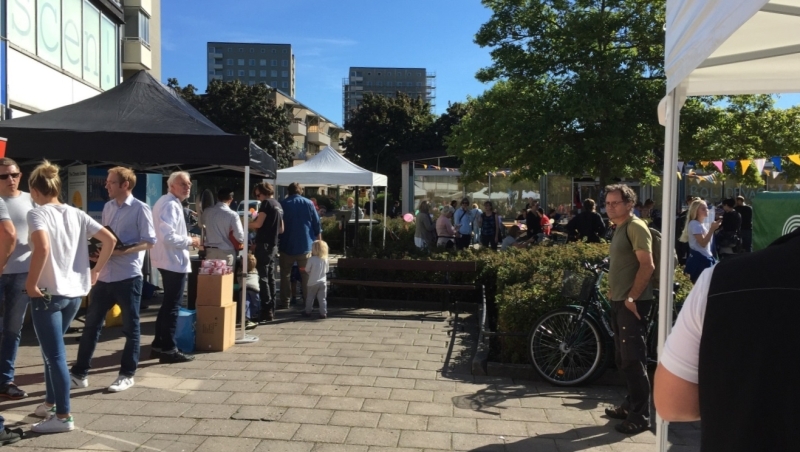 OpenAir Cologne is a joint project of the Oklab Cologne, the City of Cologne, the TH (University of applied Sciences), the University of Cologne and the For-schungszentrum Jülich (research center). 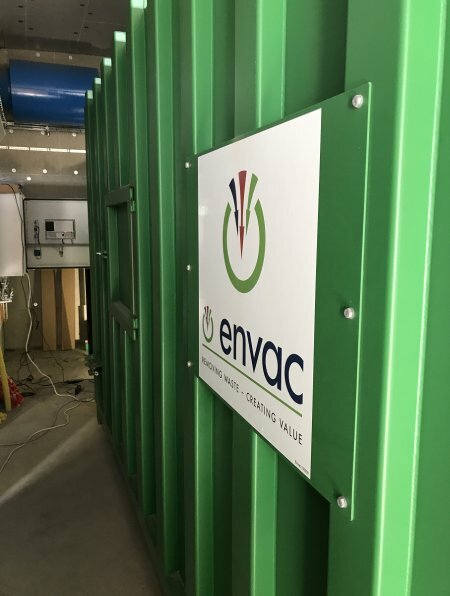 The project focuses on generating data, especially measurements of fine particulate matter, through environmental sensors. 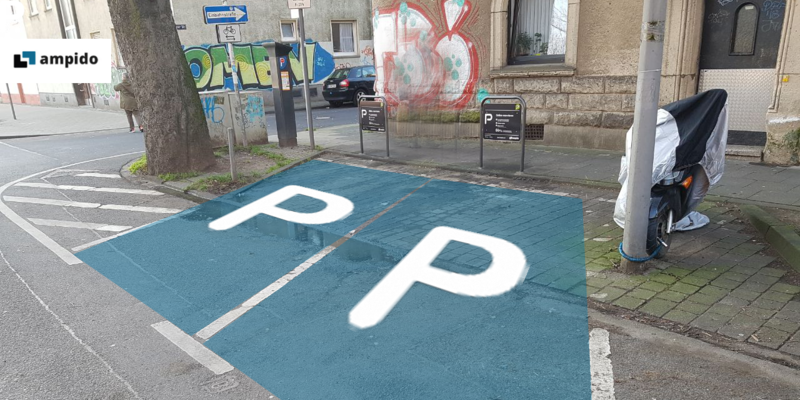 This project is the outcome of an idea from citizens, supported by science based institutions and initiated by the City of Cologne. The overall idea came about via “Citizen Science”, in which citizens and their ideas and perspectives are actively involved in governmental tasks. The objective is to connect citizens with their local public administration and to accelerate cooperation between the government and the inhabitants in the areas of Open Data, participation and citizen information. The greater purpose in this context is to enable an actual collaboration between citizens and the government. The project is being implemented by collecting sensor data from volunteers and processing them for the community as Open Data, as well as to open them for discussion and to review their informational value. The goal is that the sensors will allow coverage of a large area in order to generate as much reliable information as possible. 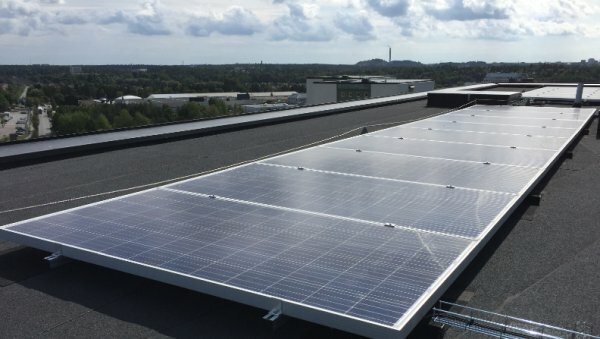 To support the project, the city offers different types of workshops, from soldering to understanding weather forecasts. 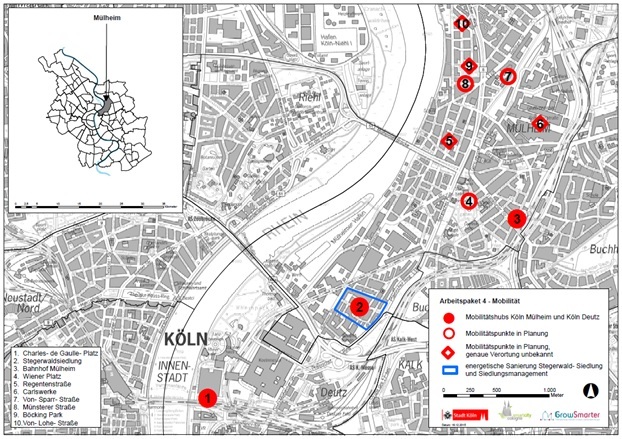 Given the current situation, OpenAir Cologne was able to set up 50 environmental sensors in the urban area of Cologne. 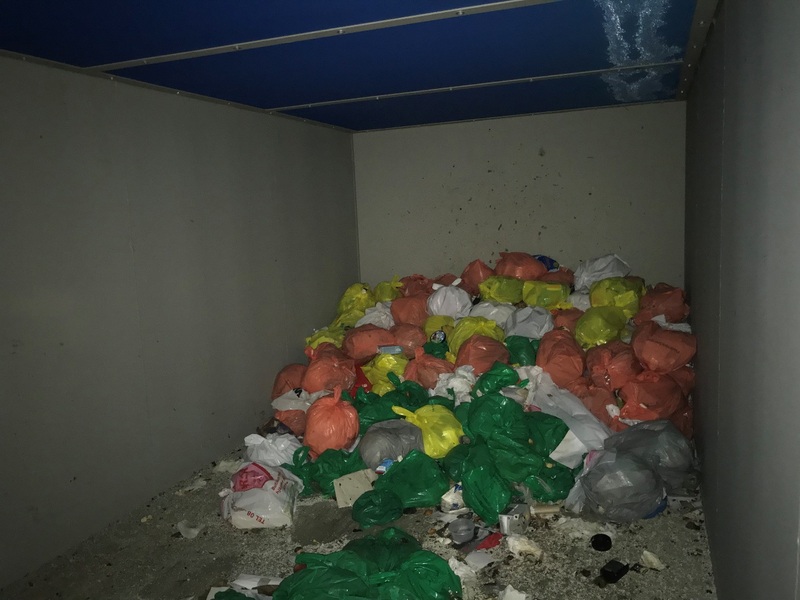 Most importantly, it was possible to raise awareness and interest for the environment and to disseminate environmental topics amongst the public. 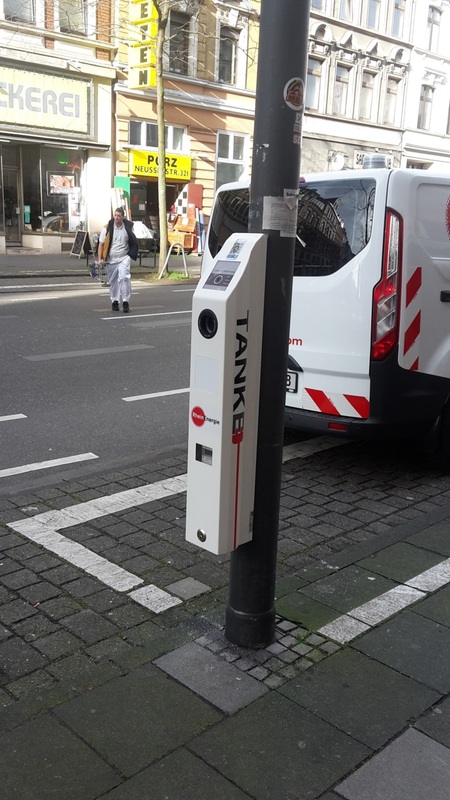 All ten planned mobility stations are now in place, in various sizes and with various combinations of partners. 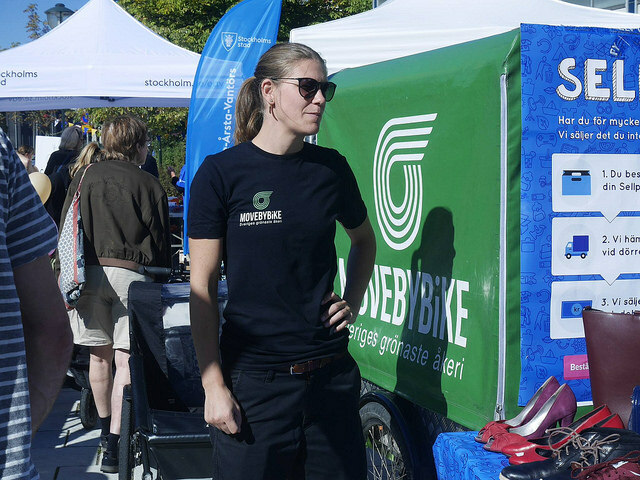 Three mobility stations will be equipped with e-bikes this month and next. 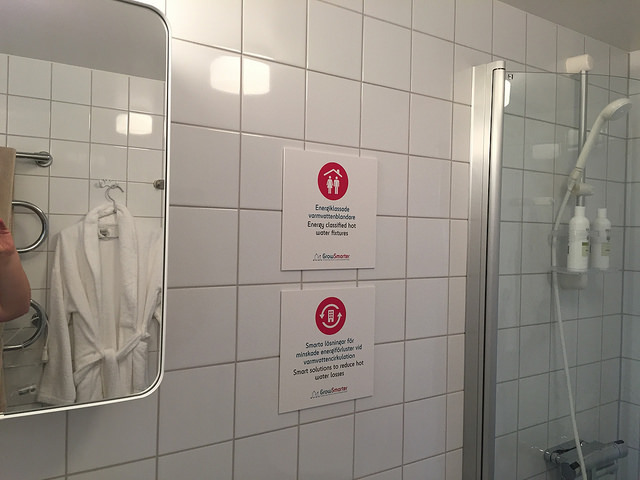 Photos of the individual stations can also be found in our previous blog post. 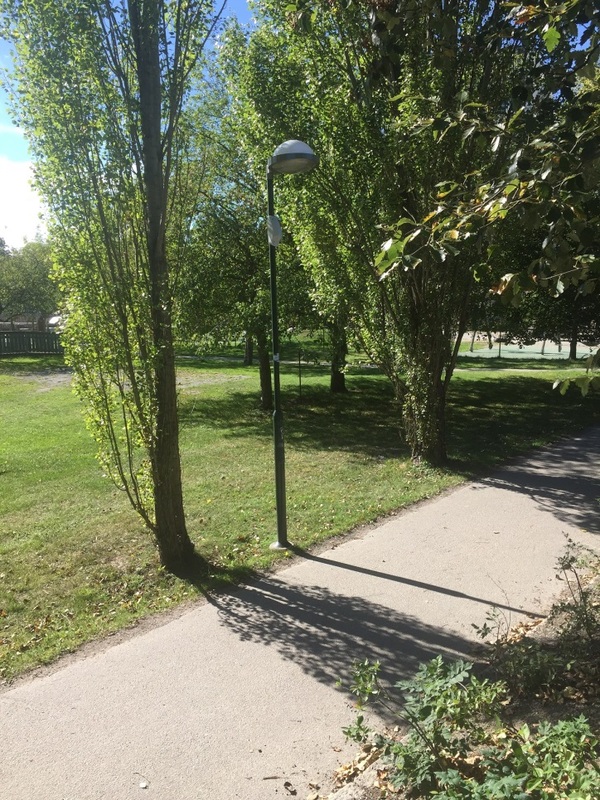 After overcoming some legal stumbling blocks for ampido locations in public spaces, the team has now been able to integrate this partner with the inclusion of some spe-cial clauses in the law. Ampido is equipping the Mobility Stations with parking spac-es that can be booked in advance. 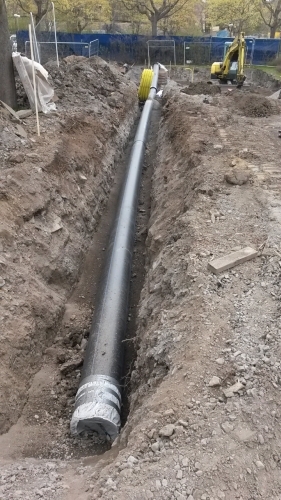 This system has so far only worked on private land and is now possible on public lands for the duration of the project or until city ordinances change. Ampido is represented at the Mobility Stations found in the map above. Some of the stations have already been shown in previous blogs. 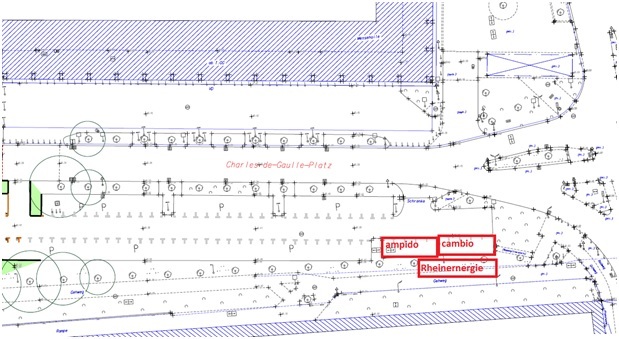 These photos show only ampido’s spaces, as they are the most recent additions. 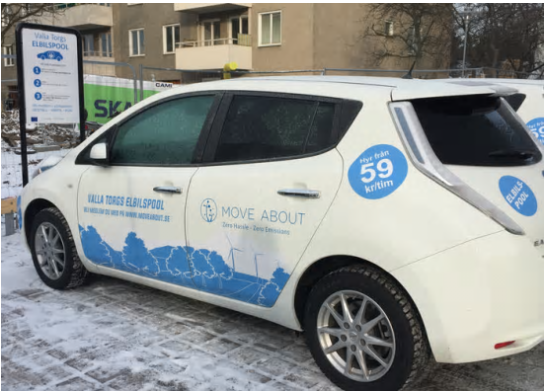 The mobility partners in the project are convinced that better utilisation of Mobility Stations depends on their attractiveness. 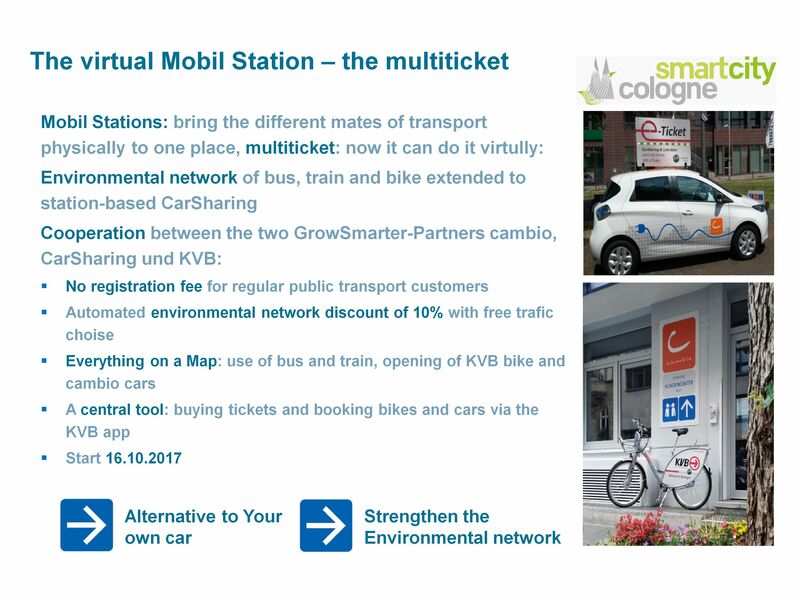 cambio CarSharing and KVB have there-fore developed a combined mobility card: the “MultiTicket”. 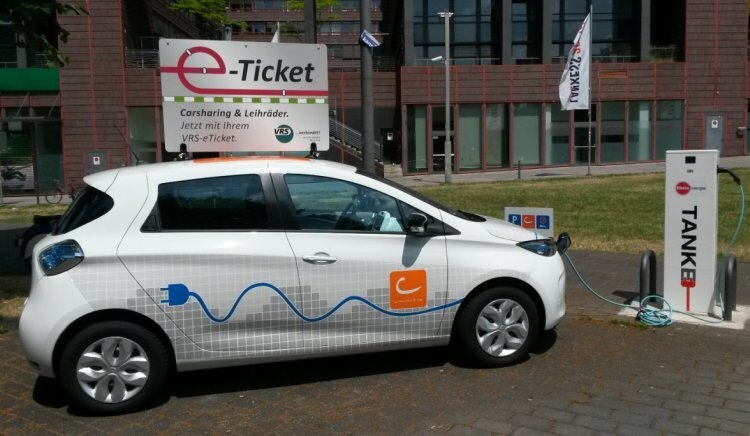 With the MultiTicket all means of transport (bus, tram, car- and bike-sharing) can be used. 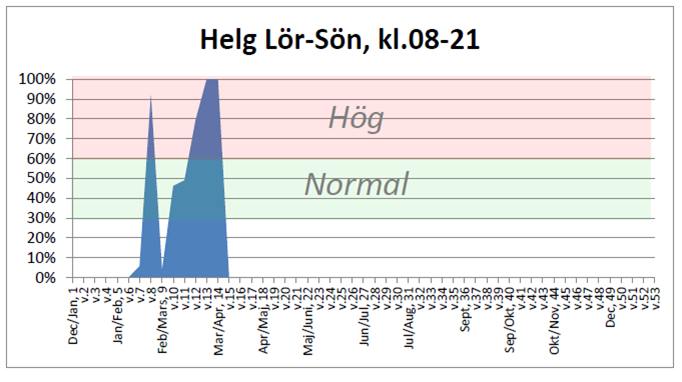 It is a further de-velopment of the existing "JobTicket", a monthly ticket paid for by companies for their employees. 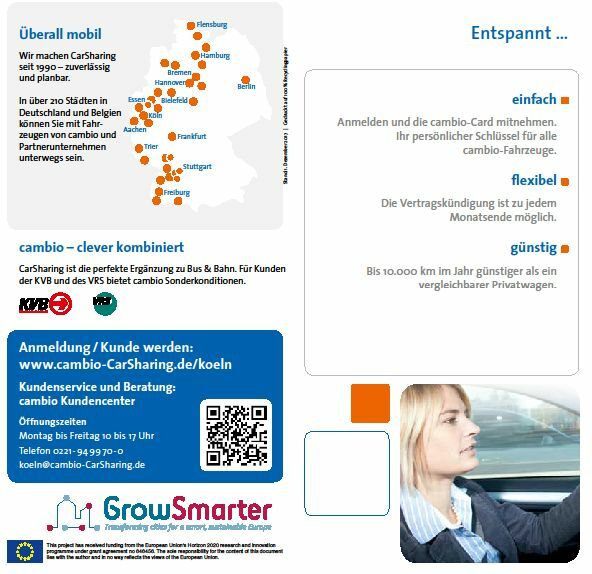 All JobTicket users are now able to register with cambio in order to use their car-sharing cars. The cars themselves can be opened with the MultiTicket - no further card is needed. 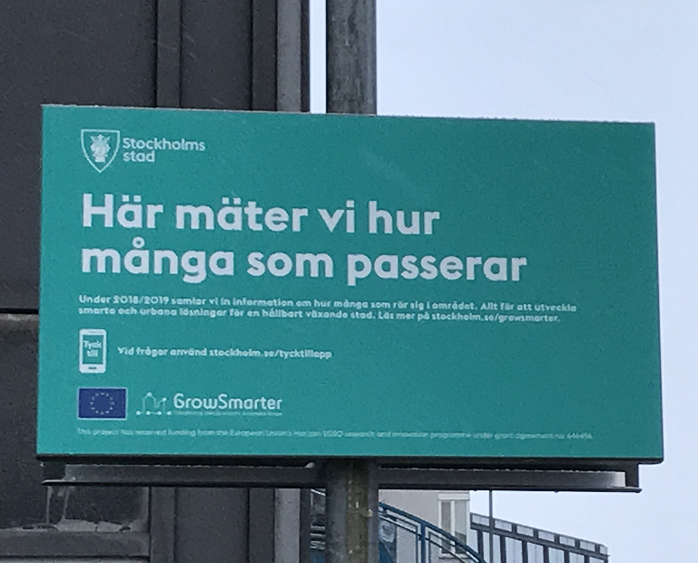 In addition to public transport, all MultiTicket users get a dis-count of 10% for car-sharing. 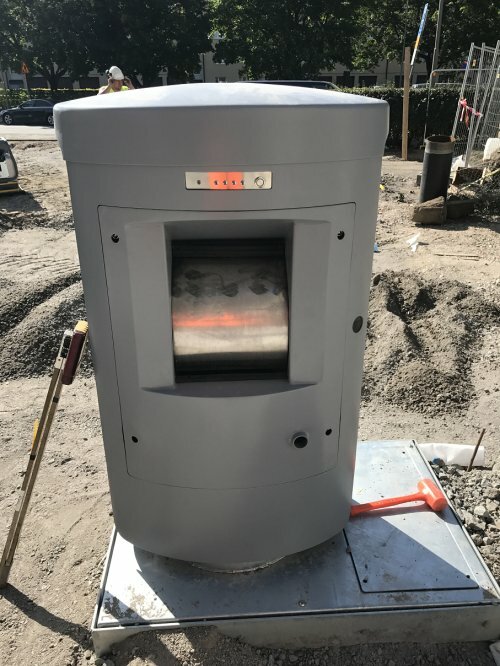 The MultiTicket, which became available in October 2017, offers virtual consolidation by bringing the various modes of transport to one place, which the Mobility Sta-tion does physically. The introduction of the MultiTicket has not yet been promoted with a major press and advertising campaign. 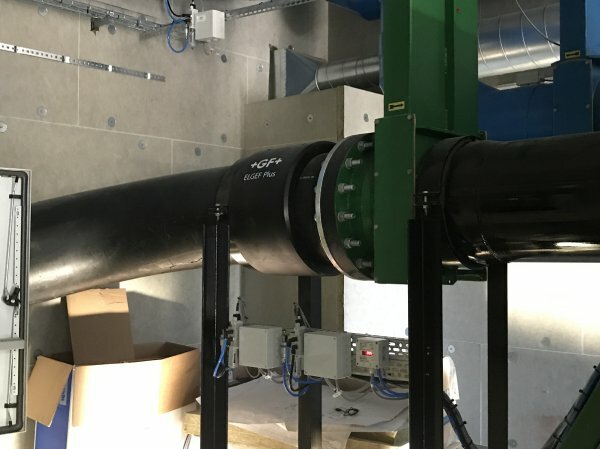 Still, the offer was very well received - almost 500 people have registered already, almost one third of the overall new cambio customers since October 2017. 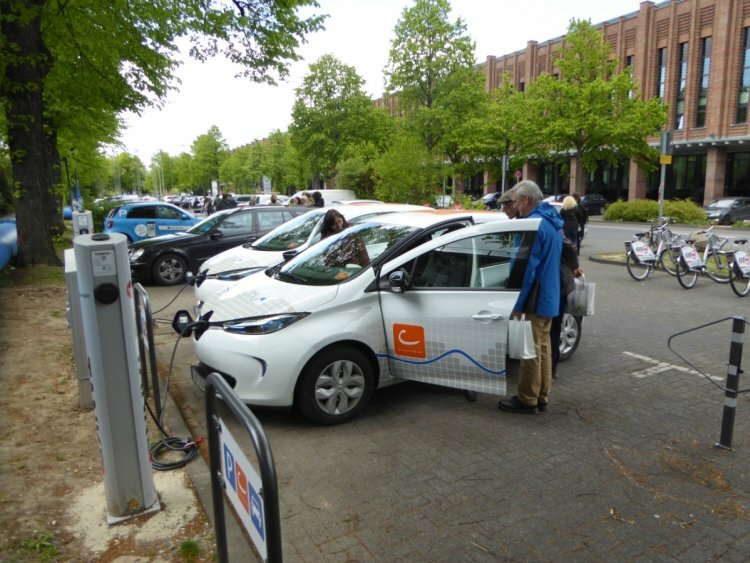 The use of the new Mobility Stations in the Mülheim project area has also increased. 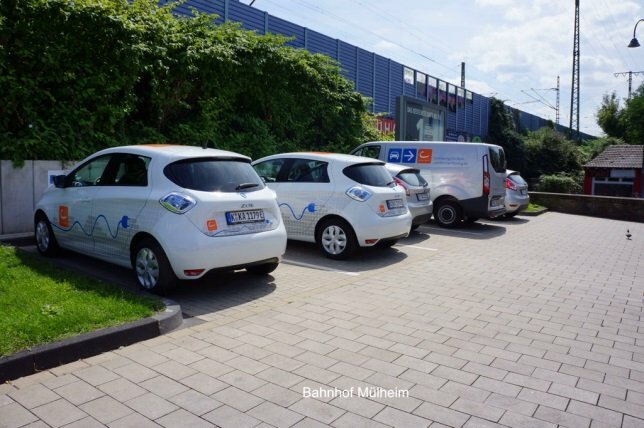 In the near future, further advertisement of the MultiTicket is planned in order to gain more customers and to make the Mobility Stations even more successful. 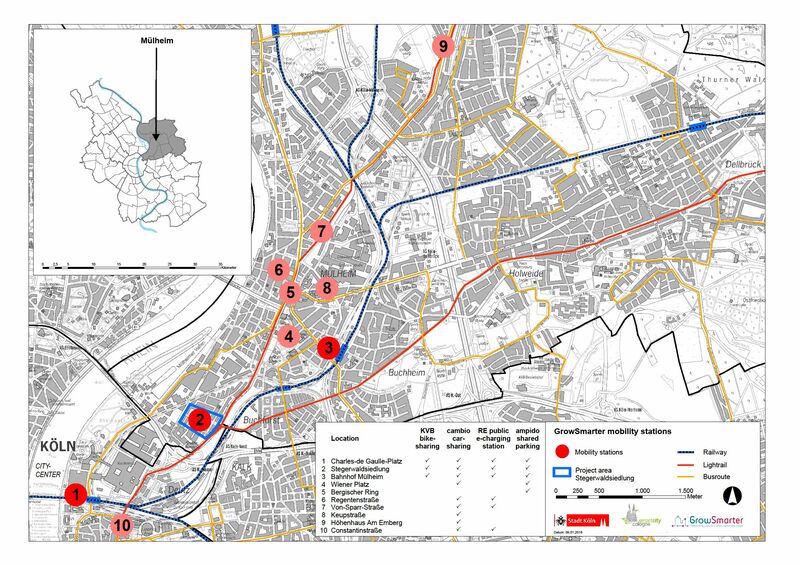 Find out how we are working with our industry partners to build up a route of several mobility points from Messe-Deutz station North through the Stegerwaldsiedlung and the wider Mülheim district. Our data platform continues to be developed and has already stimulated local entrepreneurs to create some 25 Apps. 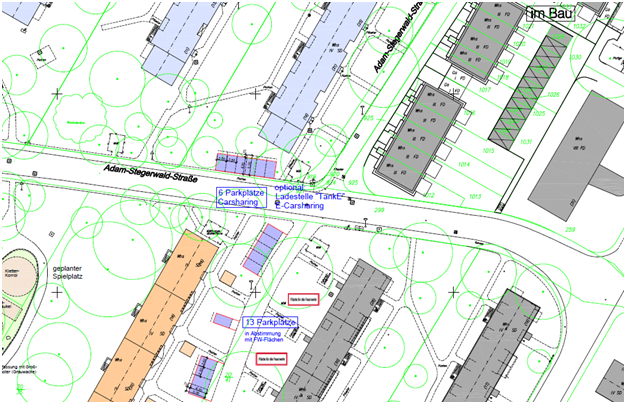 Those of you who have read my previous blogs will know that as part of the GrowSmarter project we are developing the City of Cologne’s open data platform www.offenedaten-koeln.de to include new datasets to help improve traffic management. 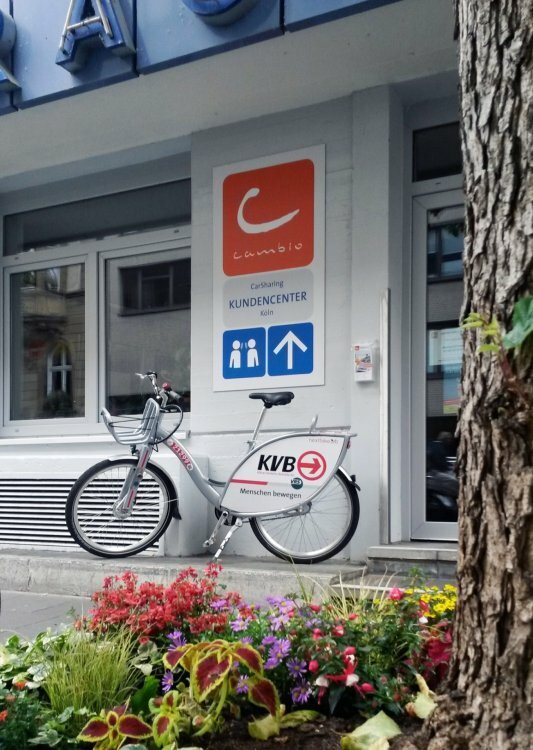 Cambio carsharing and KVB (both GrowSmarter industry partners) have now provided datasets on the locations of the rental cars/ rental bikes, respectively as well as their actual positions when in use, so we have both static and dynamic data now available for these services. Our partner [ui!] 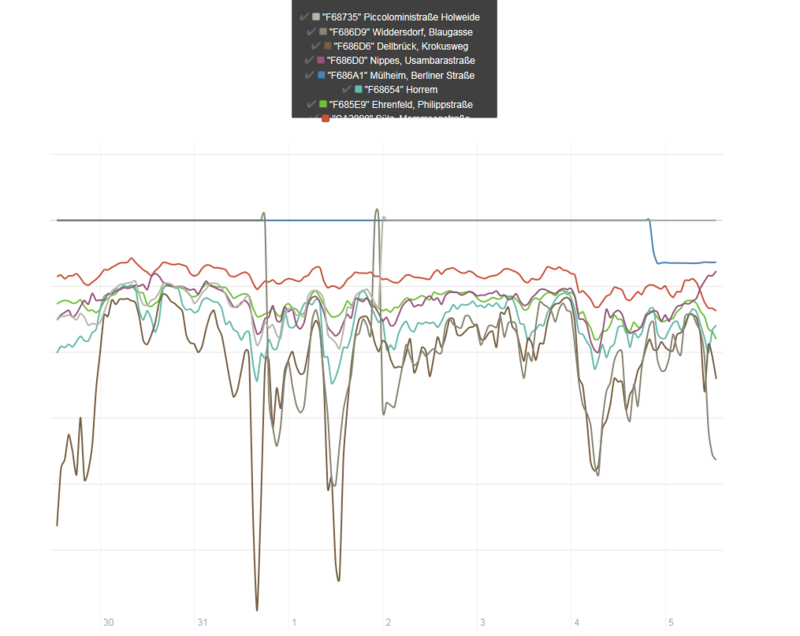 – the urban institute is now busy implementing these datasets into the cockpit of the open data platform. 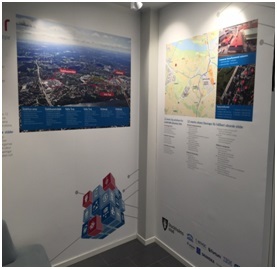 Some 25 Apps have already been developed based on the Cologne open data platform which shows a wide range of different use cases and we hope that by adding richer datasets will open up new value chains that spawn innovative and smart solutions which in turn boost sustainable modes of city living and working. So now we made the first step in motivating the people to change their behaviour. 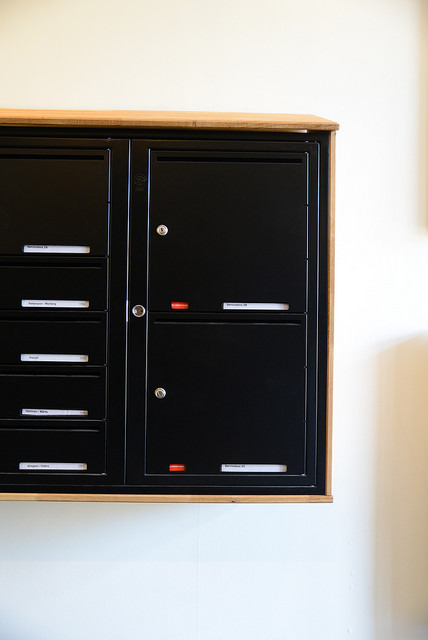 It’s so easy to check for the next cambio station or the next bike to use! Curious how it works? 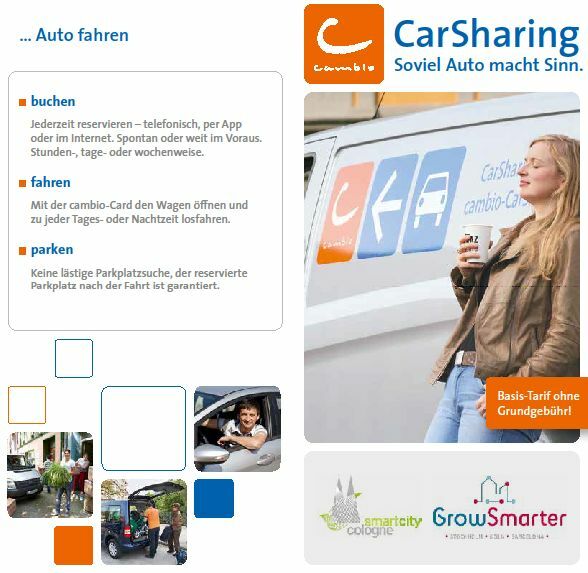 Check at www.cambio-carsharing.de/koeln and www.kvb-rad.de/de/koeln/ about the terms and conditions. 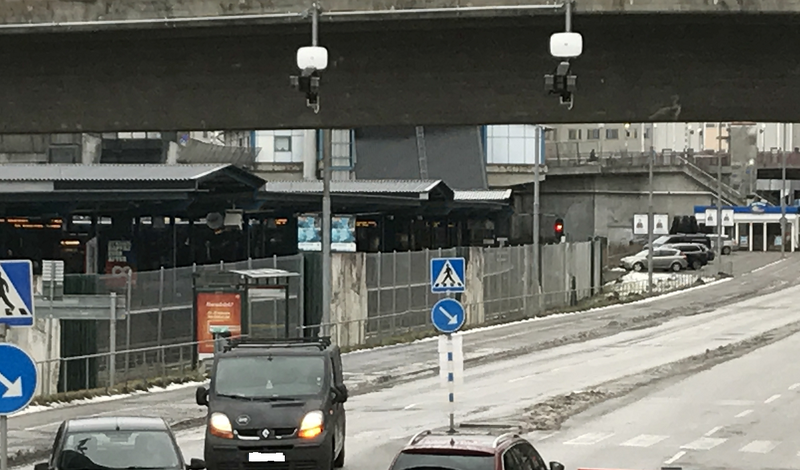 Urban planning of mobility hubs – when do public and private interests overlap? 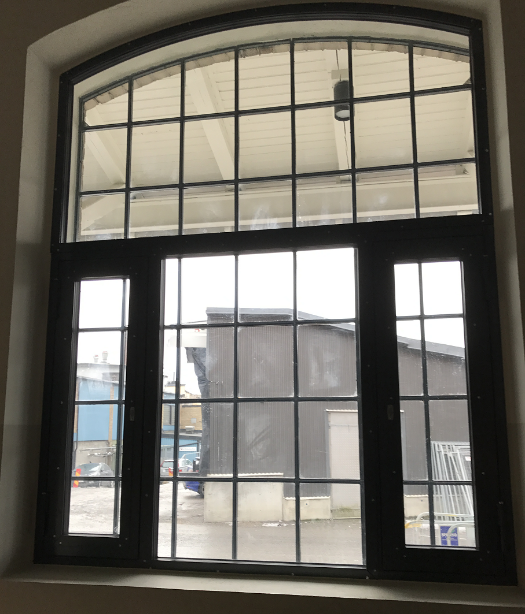 In our first blog we mentioned our plans to develop mobility hubs at strategic points throughout the Mülheim area and the Stegerwaldsiedlung (no 2 on the map), where intensive building refurbishment is taking place as part of the GrowSmarter project. It has taken a bit of time, but now we have some new updates to share! 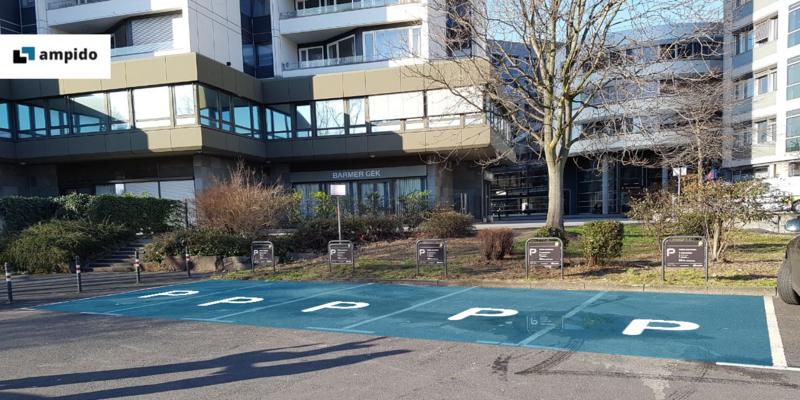 Located to the North of Messe-Deutz station, the Charles-de-Gaulle Square lies between Auenweg and the river Rhine and is well connected with trams, regional trains, as well as, the high-speed ICE trains for long-distance travel. Parking lots currently for cars (bikes to follow) to the East of this square are currently rented out privately, while those to the West are managed by the City. The latter is classified as fiscal property, which is not under public law, and provides enough space for all modules of mobility hubs. 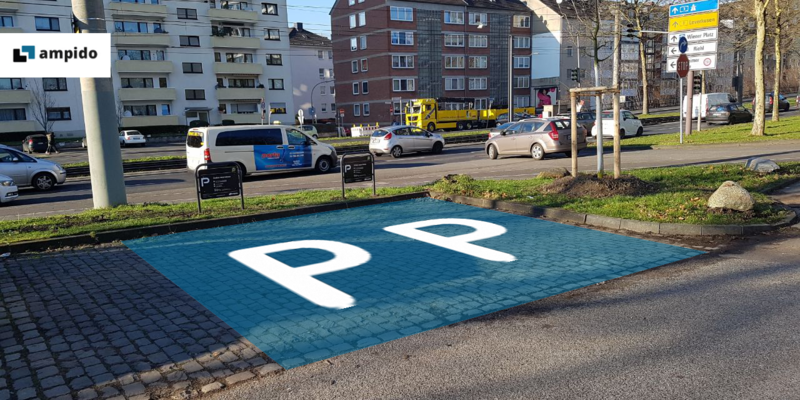 Our GrowSmarter partners in Cologne, Cambio and Ampido submitted applications with the City administration at the beginning of the year to manage some of these parking lots. These applications have been accepted subject to conditions, mainly related to design elements. 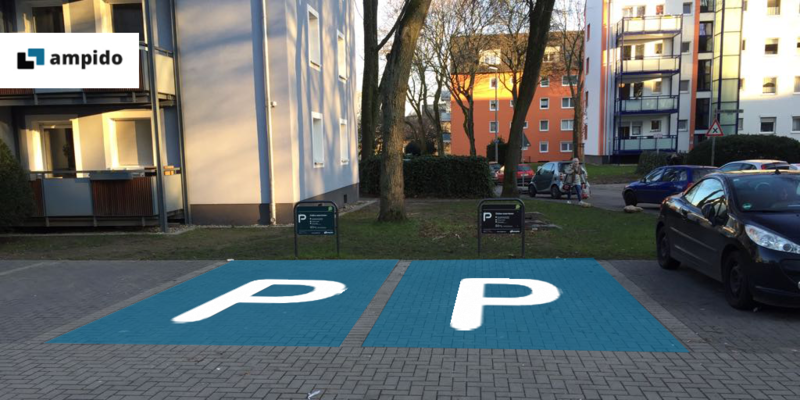 Ampido will manage five parking lots using the online management of parking space. 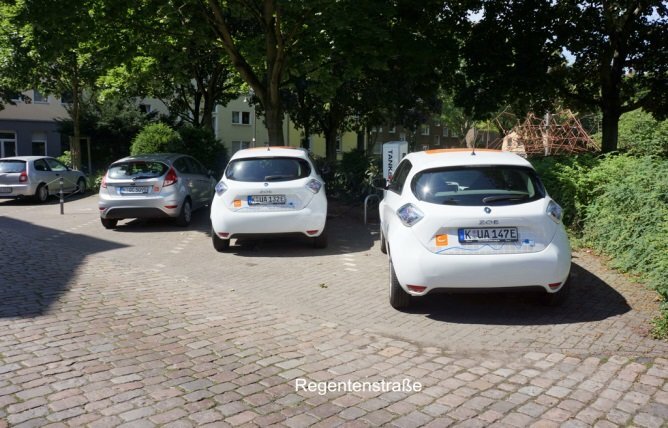 Cambio requested five lots, two for electric vehicles and three for conventional vehicles. 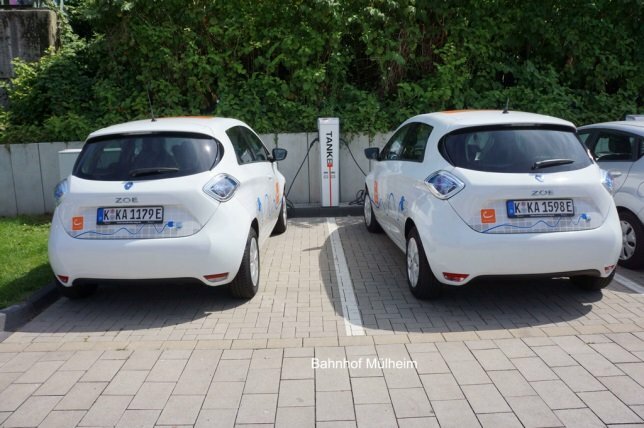 It is also envisaged that KVB will set up a public electric charging station for two electric vehicles. 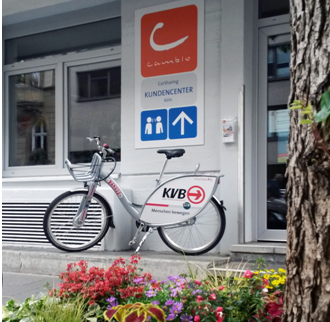 KVB AG will install a bike rental station in the immediate vicinity of the station providing both electric and pedal bicycles. The exact location has yet to be determined. 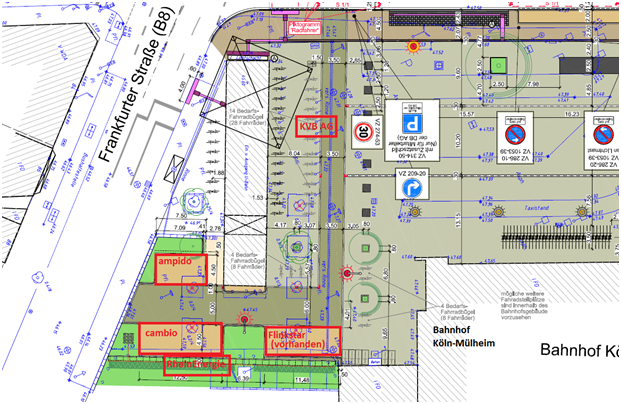 Moving over to the Stegerwaldsiedlung, the mobility hubs here will be built on property owned by GrowSmarter partner DEWOG, which is also closely located to Cologne’s public transport system; station stop Stegerwaldsiedlung offers connections straight into the city centre. Arrangements to accommodate all of the proposed mobility solutions within this hub will be managed by DEWOG and the other partners. Preliminary consent for this process has been signed by DEWOG. 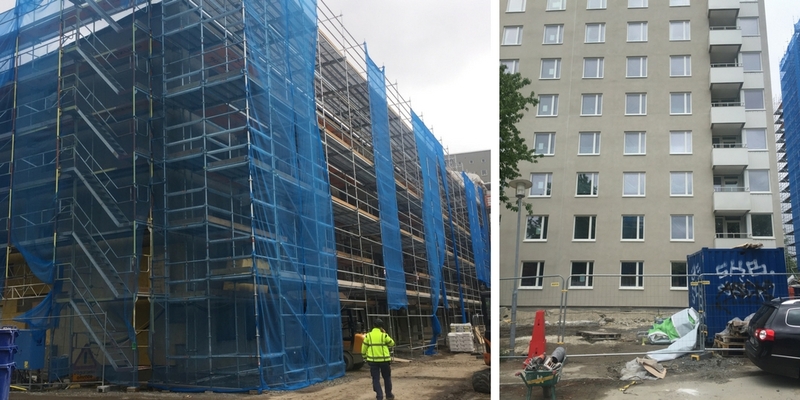 As large-scale retrofitting of the buildings in Stegerwaldsiedlung are underway to improve energy efficiency, as such the outside area is partly needed for the building site. 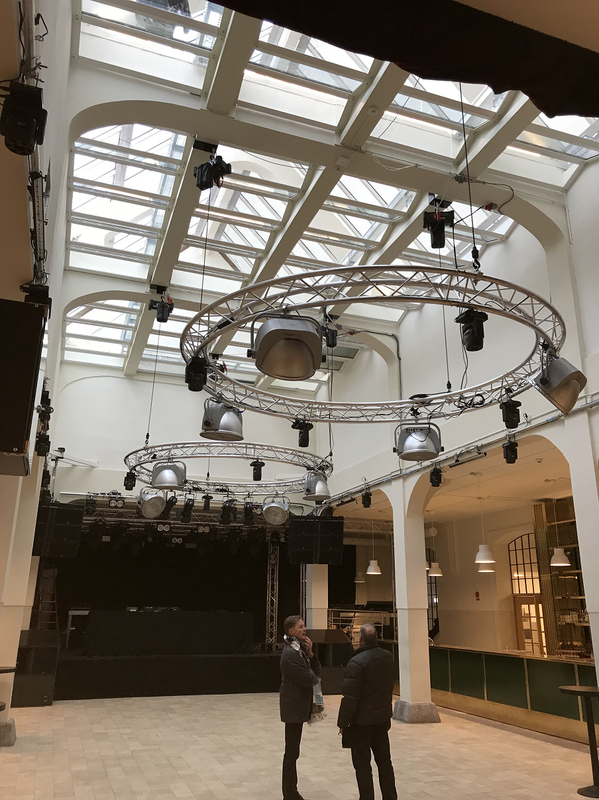 Therefore, implementation depends on the progress of these renovation activities. Current plans are shown below with the exact allocation of the industrial partners has yet to be determined. Recently refurbished as part of the Mülheim 2020 project, the forecourt of the Köln-Mülheim station sees many passengers pass through every day on their way to and from the city either by bus or the city light rail network, provided by KVB. The station is a connecting point for commuter trains coming from outside the city and regional trains. 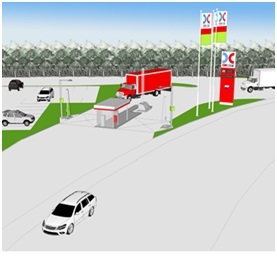 This area forecourt belongs to the Deutsche Bahn (DB) and is currently managed by a DB AG subsidiary, car-charing company Flinkster. 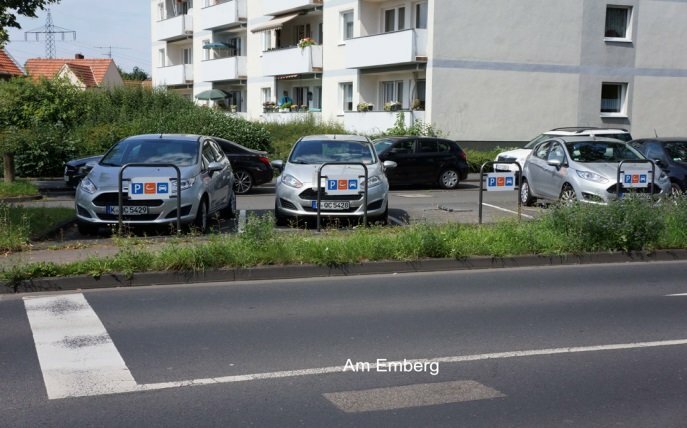 Based on the licensing agreement concluded between Deutsche Bahn AG and the city of Cologne, DB AG has agreed to provide Ampido and Cambio with the use of two parking lots each. The exact allocation has still to be agreed upon with DB AG.